Rice Krispies Squares is a dessert made from Rice Krispies cereal bound together with a mixture of melted butter, melted marshmallows and vanilla flavouring. The marshmallows are melted with the butter, the vanilla flavouring stirred in, then the Rice Krispies. The mixture is stirred well to combine all and is then turned into a buttered pan, usually square, then let sit. When firm, they are cut into squares. 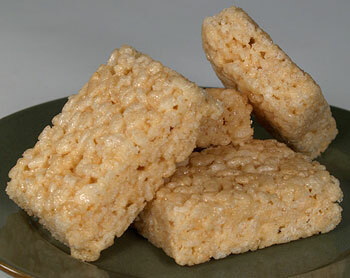 Packaged, ready-made ones called Rice Krispies Treats were introduced 15 January 1995. 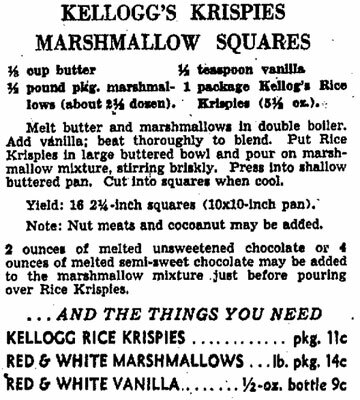 1941 Rice Krispies Square Ad & Recipe. Manitoba, Canada. 9 April 1941. Page 12. Click for full size. 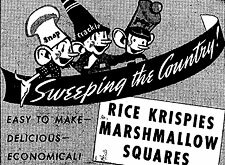 Rice Krispie Squares were first called “Marshmallow Squares.” Two Kellogg’s employees, Malitta Jensen and Mildred Day (1904 -1996), are credited with their invention in 1939. You will read that similar recipes existed already at the time for Puffed Rice and Puffed Wheat. Similar, yes, in that they ended up as sticky squares, but neither recipe used marshmallows, drawing instead on ingredients such as molasses, and neither with the simplicity of Marshmallow Squares. Rice Krispies cereal came on the market in America on 29th February 1928. Mildred Day graduated from Iowa State University later that same year. The Muscatine Journal and News-Tribune. Muscatine, Iowa. 13 March 1941. Page 8. The recipe first appeared in newspapers in 1940. It first appeared on the cereal box in 1941. The original recipe has never been changed. The confused assocation with the Campfire Girls likely came about because the recipe uses marshmallows; Campfire was a popular brand at the time. 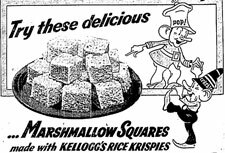 Rice Krispies Treats, the ready-made product, were not introduced until 1995. 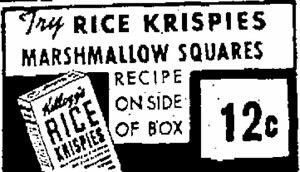 1940 Rice Krispies Squares recipe, with costs. Mildred Day, the culinary genius behind Rice Krispies bars, died a week ago in Bloomington, Minn. She was 92. Kellogg now sells Rice Krispies Treats as individually wrapped snack bars. Daily Herald. Chicago, Illinois. 16 June 1996. Page 11. Her gift to Us: Recipe for Rice Krispies Treats. Carol McGarvey, The Des Moines Register, June 14, 1996. Page 1. Beekeepers in Parley Hear Reports. San Antonio Light. San Antonio, Texas. 24 November 1936. Page 26. Ad in Ames Daily Tribune-Times. Ames, Iowa. 10 April 1935. page 3.